Prominent & Leading Manufacturer from Ahmednagar, we offer green hdpe plastic netrika or plastic chandrika hdpe sericulture net. 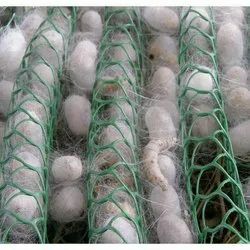 Highly popular across the Sericulture industry, Netrika Sericulture Nets play a vital role in the breeding of silk worms. It helps in formation and harvesting of silk worm cocoons and conduct the process in a hygienic environment. Our sericulture nets are more versatile than traditional bamboo mountages. As compared to bamboo mountages our nets are machine made; so they have uniform corrugation which helps in uniform cocoon formation and easy harvesting.